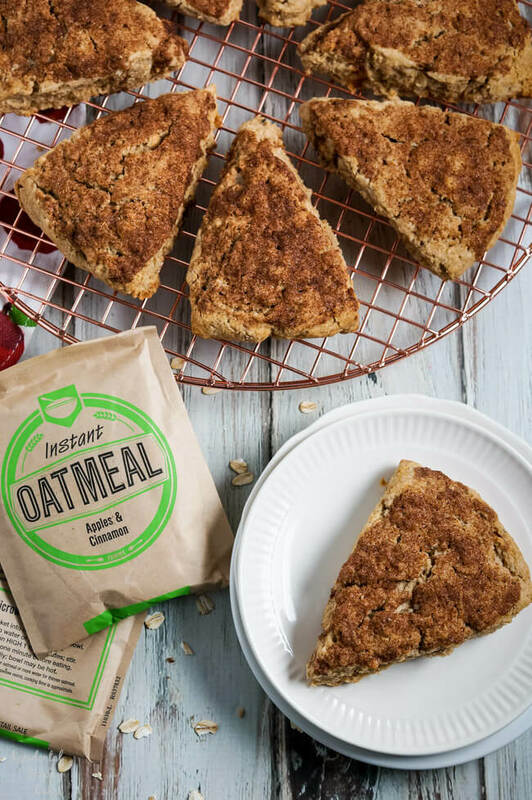 These sweet and tender instant oatmeal scones are baked with a crunchy cinnamon sugar topping and made versatile by using instant oatmeal packets! I love a good baking hack, don’t you? I love taking something simple and easy that I already have on hand in the pantry and making it just bit better. I know you all love doing this too, because the most popular recipe on AHB is how to make jiffy cornbread mix better. Well, today I’ve got another baking hack you’re going to love. 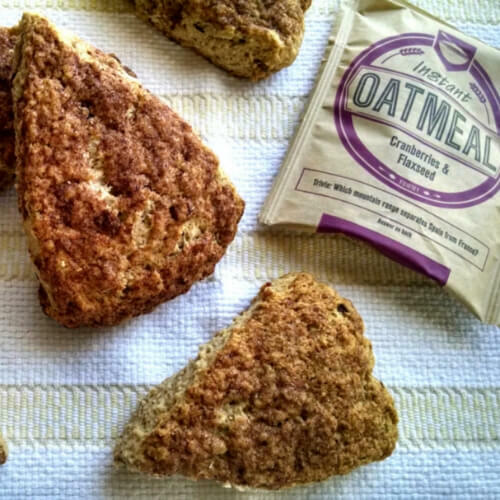 Instant Oatmeal Scones. 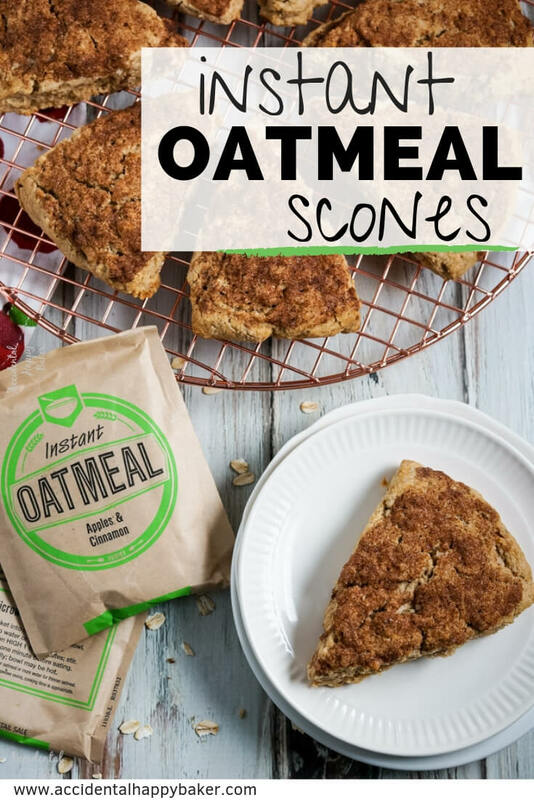 Not only do you probably have most of the ingredients on hand already, but because it relies on single serve packets of instant oatmeal you can change up the flavors and have a completely different scone just like that. My personal favorite oatmeal choice for this recipe is Apple Cinnamon, but there are so many good choices out there: Raisin, Date and Walnut, Cranberry and Flaxseed, Maple and Brown Sugar, Apple and Cranberry, Blueberry Cinnamon…just to name a few. 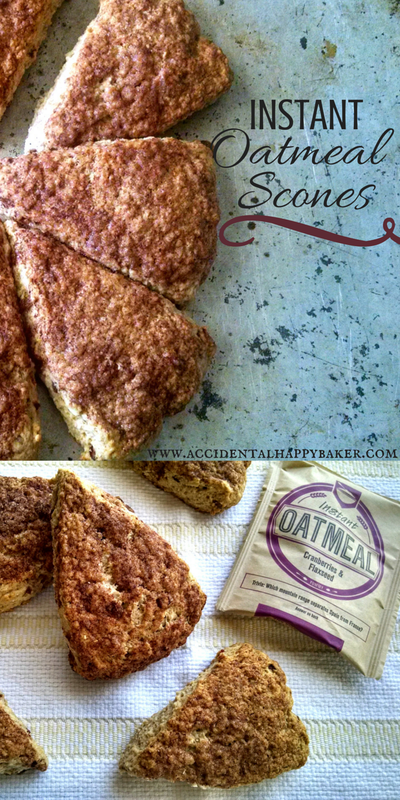 If I had to pick a favorite recipe on Accidental Happy Baker, these Instant Oatmeal Scones would be it. This was the very first recipe I posted when I started the blog back in 2015 and it’s still my favorite scone recipe to date. They are just so easy and versatile. Oh how much I’ve learned about blogging since 2015 when I started. When I look back at my first blog posts, I realize that I really had very little clue as to what I was doing. I had no idea about food photography or food styling. Honestly I had no idea that blogging was something that people made money doing! I was so green! So obviously it made sense to revisit this recipe and make some much needed updates and improvements, but I’ll leave this one old photo for nostalgia and comparison. Only use naturally flavored instant oatmeal with real fruit and nuts. No fruit and cream varieties and for heavens sakes, no dinosaur eggs! When cutting in the butter for the scones, the mixture should be crumbly and pea-sized. Sometimes the dried fruit and nuts can make this step a little more difficult. For this recipe I recommend using whole milk for a richer and more tender scone. While this recipe does have a slight kneading incorporated. Only knead until the dough forms a ball. Do not over-knead or your scones will be tough. Only slightly separate the scones before baking. If you give these scones too much room they will spread and become flat. These scones are my favorite. 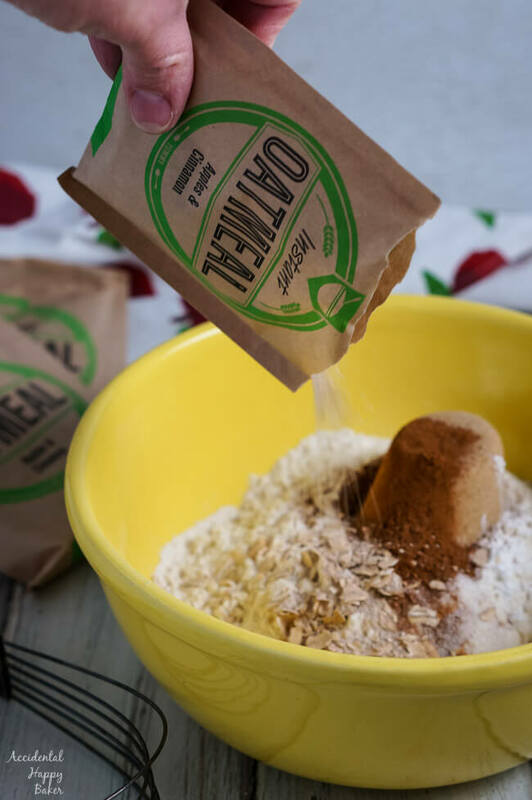 They are so versatile because of their reliance on instant oatmeal, it makes it easy to change up the flavors. Preheat your oven to 375 degrees. Lightly grease your baking sheet. 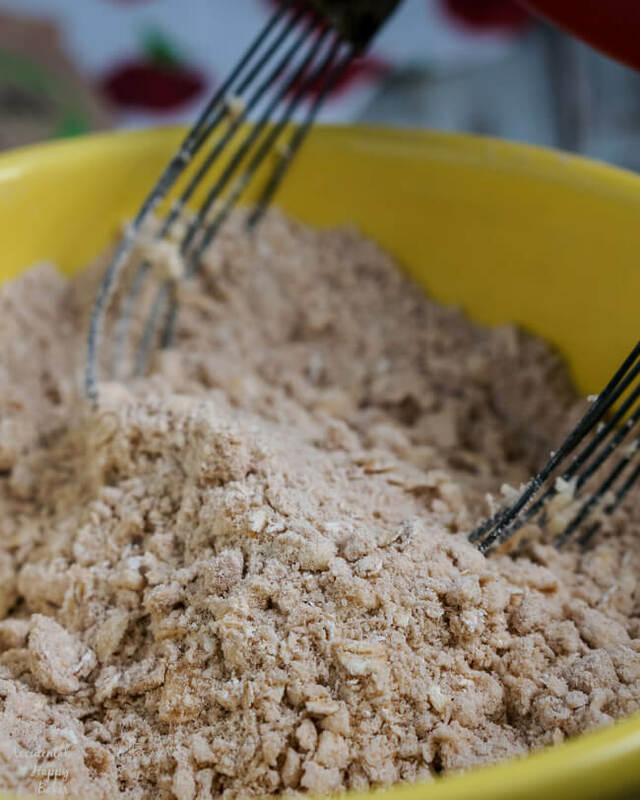 In a medium sized bowl, combine your flour, oatmeal, brown sugar, baking powder, salt and the cinnamon. Mix it together. Then, with pastry blender or a fork, cut in the 1/2 cup of butter. The mixture should be crumbly. Pour in the milk and stir it just until all the ingredients are moistened. Dust a smooth surface with flour and turn the dough out onto it. Gently knead the scone dough about 5 or 6 times. Move the dough over to the baking sheet and pat it into about a 6-8 inch round, around an inch or so thick. 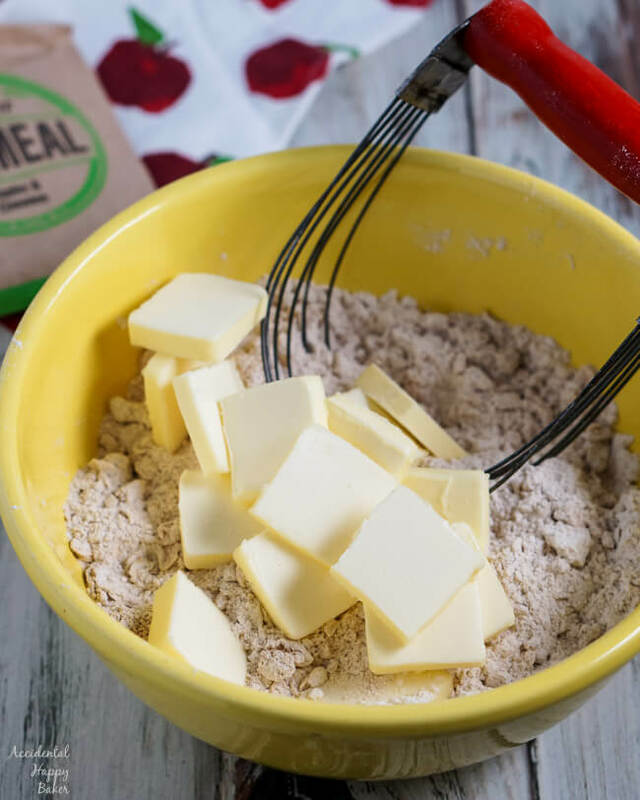 Cut your scone dough into 8 wedges and gently separate the pieces from each other slightly. Mix together the melted butter, sugar, and cinnamon for the topping. Brush or spoon the topping mixture over the round with a pastry brush. Bake at 375 for 20 to 30 minutes or until the scones are golden brown. Recut into wedges if they've spread a bit. Serve warm. Love scones? Try these next. Came across this recipe last week, and I have got to say it’s a new favorite. Easy to make, and delicious. 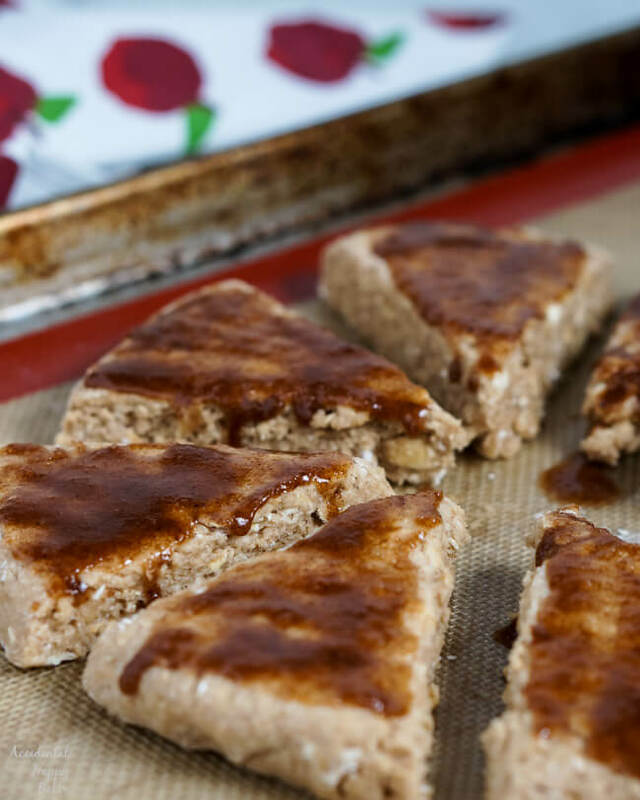 I used the cinnamon and spice packets and they give it a great flavor. I will be making these often!! Thanks Katie, it’s a definite favorite around here too. 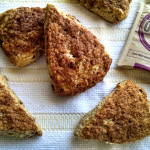 In fact, I just bought some apple cinnamon oatmeal this morning to use for scones! These look so easy and delicious. I have never tried making scones. I think the time has come! For real though, I can’t wait to try this! I might try to take some to my co-workers!! See Megan, that’s why I needed to add that part about no dinosaur eggs! Congrats on the kickoff! Your site is gorgeous 🙂 I love this idea. I have so much instant oatmeal at home (my girls love it) but I’ve been wondering what else I could do with it. This is great, thanks for sharing! Thanks Megan. It’s just been something that I always seemed to have a stash of in the house, I don’t even know how or why that started. But I keep it on hand now for these! Thank you for checking it out Katie! I’m looking forward to some REAL food recipes with basic Ingredients. Major cool points for quick healthy recipes on my tight schedule! Love Ya! Well, hopefully there will be some things that you will find here that will fit that bill. Sometimes it’s quite a challenge trying to find meals that are quick, made with real food, and don’t cost a ton! Oh yeah, and that everyone in the house will like. Oh yeah. There always has to be one naysayer in the group! 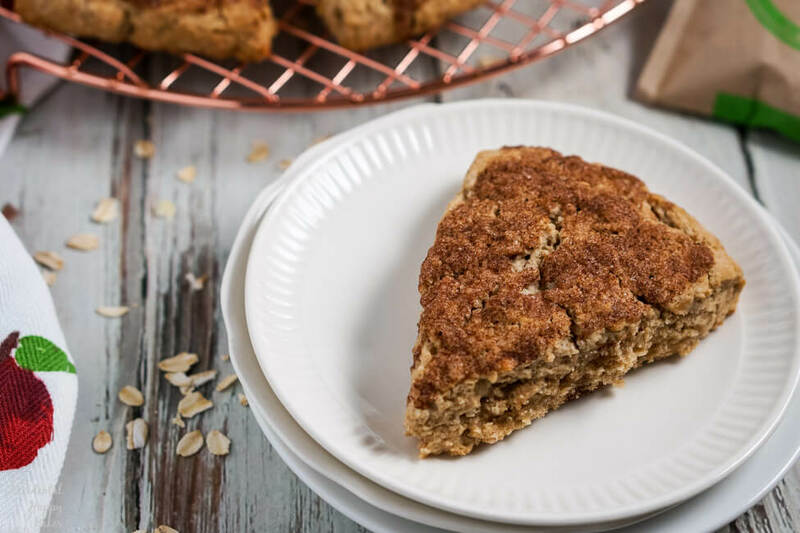 Tasty, easy recipe for scones! KC, if you were going to substitute quick oats, you’d want to use 3/4 cup in place of the oatmeal packets. If you try them you’ll have to let me know what you think. Amy, way to go! You did a great job! LOVE it! You had me at “I’m immature enough that I still call people poopheads and laugh at fart jokes.” Now, that’s a blogger I can relate to! LOVE you are keeping it simple…things that can be done with two single-serve oatmeal packets? Awesome! Congrats! A BIG day for you! Congrats on a MAJOR stepping stone in blogging!! Ready and…. LIFT OFF!! I do hope that it will be an exciting and yummy blogging journey. It’s been a lot of fun so far! Thanks for your kind words Chris. I love your transparency! Thank you for being real! I tried being fake as an adult once. It ended very badly for me. So I knew that when I started this I needed to be as straight-up, straight-forward, awkward, nutty me or it would bomb! Thanks for checking out the blog! I appreciate it so much. Congrats on the blog launch! And those scones… yummy. Thank you so much Andrea! I appreciate you taking time to stop by and take a look. Hopefully you’ll find lots of yummy around here as the blog grows. Thank you so much, Jennie. Amy this is great, so excited for you! Aw, thanks so much Jolean. Your support means a lot to me! Woohoo! I’m excited for you and the new recipes! I love to bake and try to cook from scratch as much as we can, so I will probably be trying out many of your goodies! Great Jennifer! You’ll have to let me know what you think if you try some of the recipes. I hope that you’ll like them.